This originally was gonna be a post about Trader Joe's Pumpkin Spice Scone Mix with Maple Flavored Frosting. Cuz, you know, it's seasonal and all, and I for whatever uncharacteristic reason am on some sort of pumpkin spice kick, and given the Rodgers' historic oven-related troubles, Sandy and I figured we were the ones for the job. But somehow in between taking pictures and transferring to my computer, they got eaten. The pictures, not the scones. Well, the scones did get eaten too...but that's another story, and won't go into too much detail on them in case they get revisited later. Late night scrounge the fridge time then, gotta find something to review...well, hey, here's Trader Joe's Organic Reduced Sugar Cherry Preserves. What else are we gonna do? Got a lot of time left in pumpkin spice season after all. You might remember that a little while back us yinzers here went on a whole spree with the blueberry preserves. That stuff was the bomb, so would that make this a...cherry bomb? Eh, not quite. I'd say the overall quality of the product is about there - similar mouthfeel, similar texture, spreadability factor high, etc - but at the same time, it's missing a small something, and what it is, I'm not sure. It's still very good. There's a mild, smooth tartness that ends with a slightly sweet finish. It's almost - but not quite - just like eating straight cherries, except without the pits, of course. But maybe that's it right there. Fresh, juicy ripe cherries are sweet and tart and vibrant and just downright delectable in almost every way. That's not that sense here, not in the same way as the blueberry preserves. Some of the potency gets a little lost in translation. No matter. It's the current jam of choice for our oldest daughter, who loves it matched with some sunflower spread for a school lunch sandwich. Sandy and I will slather some on some fresh baked bread from our local coffee shop, and really, we've been slacking on the opportunity to put it on a grilled cheese sandwich. Our youngest daughter hates it, though, which I think is hilarious. I *think* she normally like cherries...she's a little weirdo. Eh well. Decent enough jam, and maybe it's a last little remnant of summer to bring into the fullness of fall. Pumpkin spice can wait. A burger place in my area has a delicious burger with arugula, gouda cheese, pork belly, and cherry compote. This could totally work in that application! I've had the same burger and subbed the gouda for brie, and that was also amazing. I noticed they are slowly replacing products - especially the jams- with an organic version, or in some cases offering an organic alternative. The blueberry, strawberry, super fruit blend and now the cherry. I think it's a good thing and I'm greatful that TJs has so many organic options at accessible prices! If you do want to make an intense cherry jam it's stupid easy to make chia seed freezer jam- basically fruit plus chia seeds plus simple syrup or liquid sweetner of choice and blend together. Keep in fridge a week or in freezer several months. Don't freeze in glass. Agreed that the blueberry version was great and the cherry version does not have the intense flavor that cherries should have. 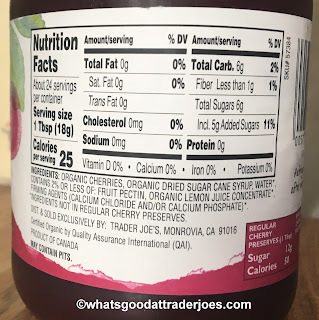 I don't know if comparing this to a brand name is frowned upon here, but just go to the jam and jelly aisle and pick up the jar that says natural in large font. 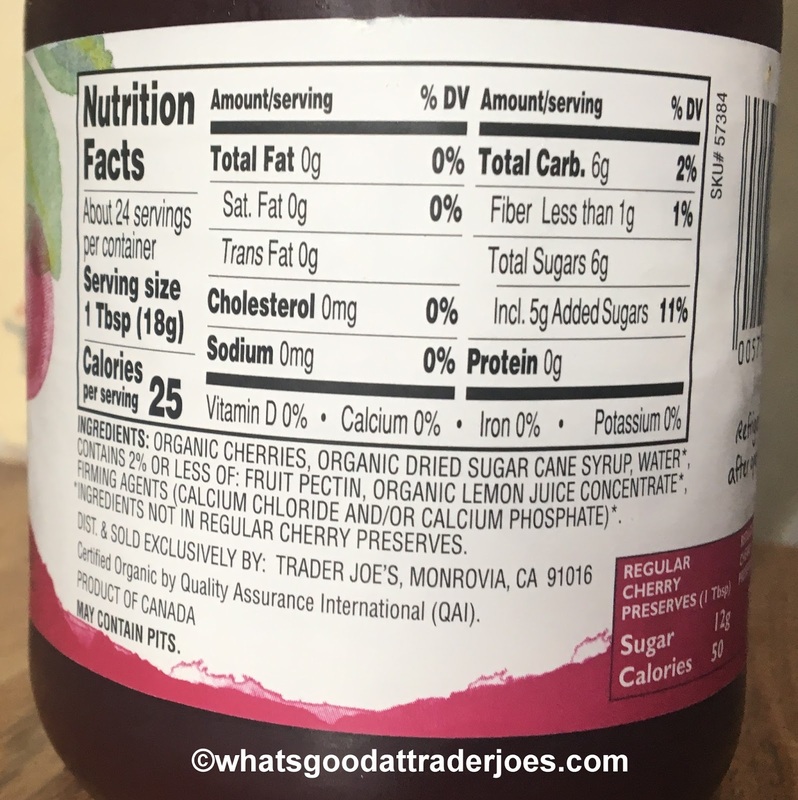 It is labeled tart cherry fruit spread and the manufacturer is probably number one in the jam and market. That cherry spread is awesome and flavor is intense. My only complaint is not enough spread and too much fruit but that's a good complaint to have. 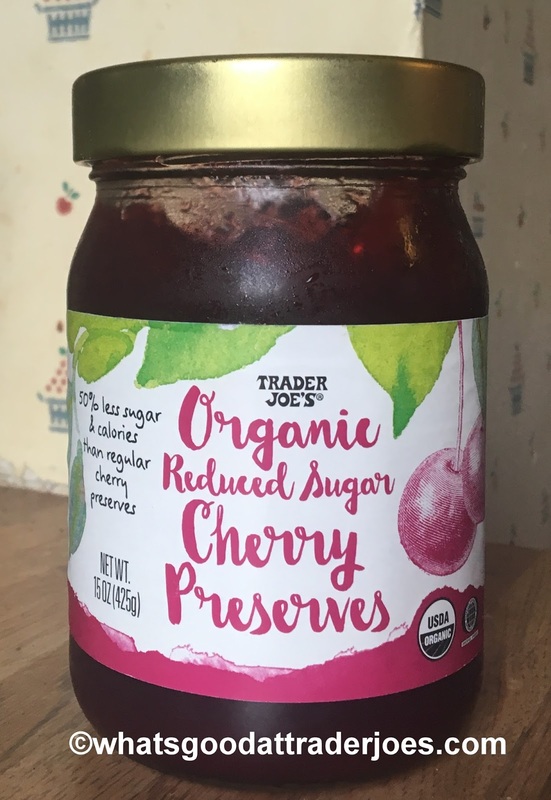 Cherry jams are most favorites among all the ages but cherrys come for a very short season so try to preserve them at home instead of buying canned cherrys.